If you visit one of Ethiopia’s kitfo houses, you will notice that the restaurant offers just one dish on the menu: kitfo, finely ground, raw beef, mixed with butter and marinated in a spicy chili blend (mitmita). The beef is almost always grass-fed, as grain-fed beef can lend itself to a different texture and flavor. The result is a meaty mixture so smooth and tender that it melts in your mouth. 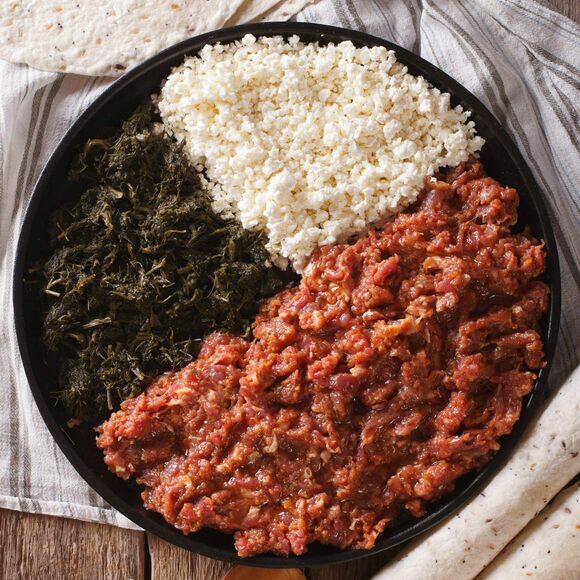 Kitfo is typically served with collard greens (gomen) and Ethiopian cheese (ayib) as well as some form of bread, either a traditional flatbread (injera) or a bread made from the banana-like enset plant. There are risks associated with eating kitfo, including worms, so butchers often take the meat from between the shoulders of an ox, as this is traditionally thought to be a worm-free part of the body. Still, some people opt to have their kitfo slightly cooked, which is known as lebleb. Kitfo is traditionally eaten at the end of the Orthodox Christian fasting season on Orthodox Easter Sunday, but it is so widely loved that it is eaten throughout the year. The fineness of the chop of the meat creates different dishes in Ethiopian cuisine. Kitfo is a finely chopped beef, whereas "gored gored" consists of bite-sized chunks dipped in chili ("awaze") paste. "Tere siga" is simpler still—just chunks of beef cut off for consumption. At this Kitfo House, a large serving of kitfo can feed several people and costs around $6. Ethiopian honey wine is sweet, funky, and perfect with injera.